I can change elements in this big kiln in 30 minutes. 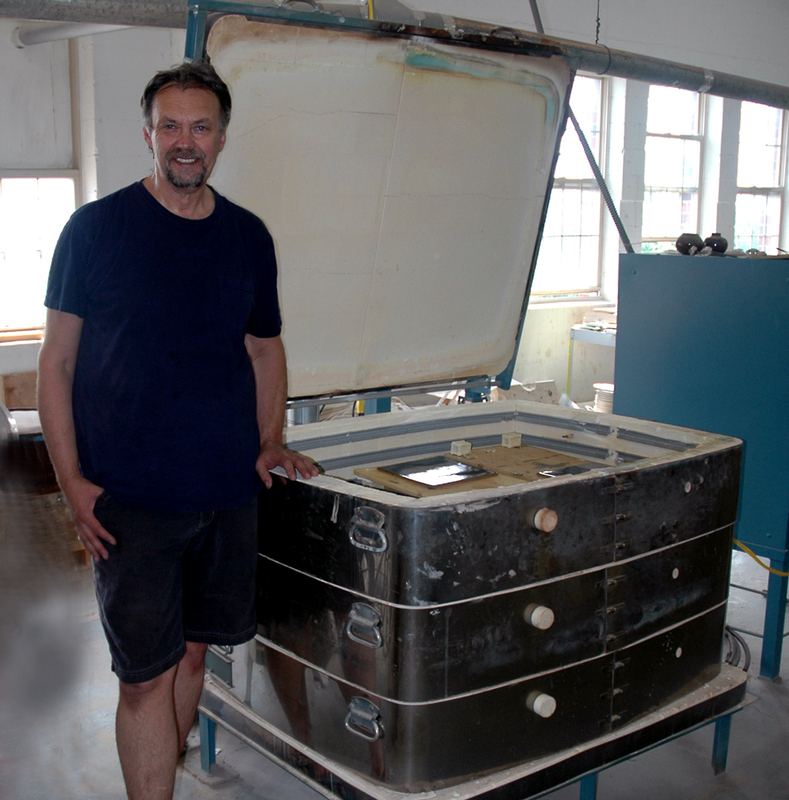 Robert Shenfeld has been teaching ceramics and working as a professional ceramic artist for the past 25 years. Prior to receiving his Masters degree in Art Education from Syracuse University, Robert pursued undergraduate work in painting and design. But it wasn't until his first job teaching 3D design that he became involved with the clay medium. His love for clay was immediate and working in clay came naturally to him. Once he mastered the techniques of ceramics, Robert was able to apply the principles of design and painting to the process of forming and glazing. Although the majority of his previous work was one of a kind, he has for the past 7 years been producing custom handmade tiles. With the recent expansion of the Shenfeld studio into a restored factory building in downtown Syracuse, New York, the 6000 square foot studio is now producing over 20,000 square foot of tile a year. 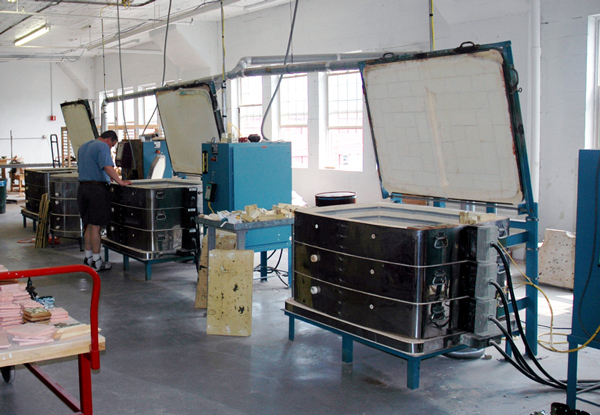 With the addition of a 100-ton tile press the production is only at a third of the studios capability. With this amount of tile work the studio needed a real workhorse for a kiln. Currently he fires all the tiles in (put in more specific info) 3 L&L DaVinci kilns. For the past 7 years each of the kilns have been fired to cone 9 an average of three times a week. I might add that the majority of the tiles are crystalline glazes and the firing programs are complicated and can run up to 15 hours with long soak periods at high temperatures. The advanced capabilities of programming the kilns and ease of changing all the elements twice a year makes owning the L&L kilns a pleasure not a regret. When Robert first began researching Crystal Glazes the local ties to Syracuse and the Everson Museum of Art were soon realized. Being able to see the original works of ceramic artists such as Adelaide Robineau were of great value. At the same time as he began his research the Everson Museum commissioned him to put back into production, as a fund raiser, an original tile produced by Adelaide Robineau at the turn of the century. The studio also produces tiles for another Syracuse company, L&JG Stickley Inc, and is currently involved in several commissioned projects.